After confronting Senator Jeff Flake on an elevator on Friday, September 28, Ana Maria made headlines in national media outlets including The New York Times, MSNBC, Telemundo, CNN with Anderson Cooper, CBS News, USA Today, The Washington Post, NPR, The Hill, PBS Newshour, ABC News, Bustle, Politico, Vanity Fair, VICE, and The Intercept, among many others. 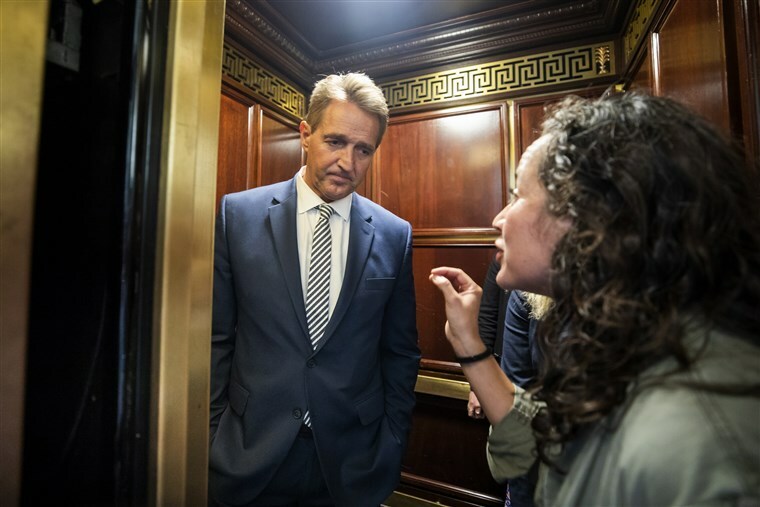 Just a few hours ago, a courageous young woman and I confronted Senator Jeff Flake on an elevator about his statement that he would vote to confirm Brett Kavanaugh to the Supreme Court. In a now-viral video, Flake could not even look us in the eyes when we shared with him our experiences of sexual assault. He would not make eye contact with me when I asked him to think about my children, and his own children. Shortly after, CNN reported that Flake was visibly shaken after his encounter with us. Our words, and the words of thousands of women who have shared their stories, moved him. Within hours, the senator announced he would seek an investigation from the FBI into Dr. Ford’s accusations of sexual assault by Brett Kavanaugh, delaying the Senate’s confirmation vote. The fight is not over yet. The CPD Network will continue to partner with the Women’s March and many allies to help everyday heroes hold the powerful accountable in Washington, D.C. This is a defining moment. We must continue to demand that our elected officials do everything they can to stop this nomination process. Donate now to support this vital work in this important moment. For the past two weeks, I have stood in solidarity with thousands of incredible survivors, along with countless other organizations to fight this nomination. When Flake announced his intention to vote “yes” to confirm Kavanaugh, it sent a dangerous message to the country that a man can sexually assault multiple women and he is still “fit” to serve on the highest court of this land. We will not let this happen. After a constant three weeks of action, we will continue to put our bodies on the line to protect our nation and our values. We plan to stay in the Capitol to sustain constant actions and occupations throughout the weekend and into next week to lift up the voices and experiences of our communities. We need your help to make this happen. Even the smallest donation will help us feed and house survivors and allies on the ground. Donate now to support the resistance in the fight to #CancelKavanaugh.